I welcome the Fall with a heart full of gladness. It's my favorite time of the year, perhaps because I was born in early November. (And I am a double Scorpio, if that has anything to do with it.) When the Fall comes, my energy gets stronger, colors seem more intense, I have creative bursts. But I have to be a bit careful or I burn out quickly. 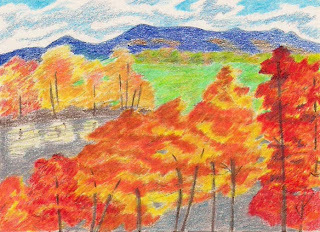 One thing I love about the Fall is the transformation of the landscape from Summer to Autumn and all the changes in the trees and grasses. I love the many hues of yellow, red, orange and purple (yes purple) that slowly appear, until the world is ablaze in color. That is the inspiration for my latest colored pencil drawing, "Glorious Fall." I hope you like it. I tagged you at my blog and you are it. Come on by and see what awaits you.